Act quickly! If you’ve lost your pet, start looking immediately. Always leave recently worn clothing at your front and back doors so the animal can smell its way back. Ask your neighbors to open their garages and sheds in case your pet has become trapped inside. Post flyers in the area where the animal was last seen. Make sure your flyer is easy to read, brief and large with an accurate picture and details about identifying markings. 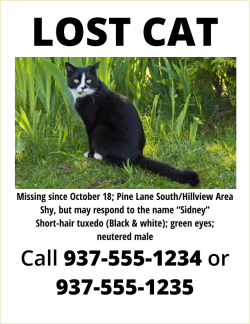 Hit the streets and hand the flyers out to everyone and anyone -- people are typically very helpful in looking for a lost pet. Use your social networks like Facebook or Twitter to post photos, description and your contact information; encourage people to share. Check out pets at shelters at PetFinder.com. The Franklin County Auditor is responsible for licensing dogs in Franklin County, and has a lost and found page limited to dogs. Visit doglicense.franklincountyohio.gov/Home/DogeSearch to look for your pooch. Call the Union County Humane Society at 937.642.6716 to ask about your lost pet. Our staff will assist you in looking at the animals currently in our facility. We hold animals that seem to be owned for three full days (not including the day of admission or disposition). Call Mary Jane Stockdale at 614.471.7397. She is a lost/found service. Call the Logan County Dog Warden at 937.592.5731 or the Union County Dog Warden at 937.645.3016. Visit local shelters to look for lost dogs. Ohio statute provides no requirement for the sheltering and holding of stray cats, therefore, most county and municipal governments do not provide for the pick-up and sheltering of cats. As a result, the local animal control facility only provides animal control services and sheltering for dogs. Animals who’ve been lost for months or even years have been reunited with their owners. A pet—even an indoor pet—has a better chance of being returned if he/she always wears a collar and an ID tag with your name, address and telephone number. Ask your veterinarian about permanent methods of identification (such as microchips).